Players love to talk and unfortunately many will talk about other players or about friends they all know. 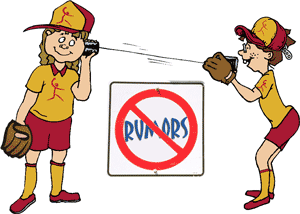 As adults we know that rumors aren’t things we want to encourage as they can be damaging to people. Fortunately we can help our players handle rumors correctly by something called the Test of Three. Before any player on your team can tell anyone else something they’ve heard that involves another person have them run the story past the Test of Three. The first test is Truth. Have they made sure that what they’re about to say is true? The second test is Goodness. Is what they’re about to say something good? The third test is Usefulness. Is what they want to tell someone going to be useful to the person they’re telling it to? And gossip isn’t useful. If they can’t answer yes to all three questions then it isn’t something that needs to be told. If your players can tell rumors about others then others can tell rumors about them. Nobody likes to have bad things said about them so it’s a great lesson for us to teach our players to treat others the way we’d like to be treated – old fashioned maybe, but still valuable.